I don't see this every day! Can someone explain pls? started something new yesterday, worked on it for a little while, then had to close and save. Came back to it 12 hours later and up came the update pop-up which surprised me a bit. Have a look and you'll see why. I am curious about why it came up, given it was on the same system that created it. The only difference appears to be the Version Code. Many times I get the pop-up when it is an older program, but I've never had this happen before. I have recently shifted onto 7-64 Pro on this puter, instead of 7-32. A totally new build, so no possible older references at all, so that makes it even more odd. This happens to me with 9.8.65 every time I create new and save. It only happens the first time I open after the first save. I notified Unitronics about it and presumably it was fixed in 9.8.79, but I haven't tested it. I haven't done a save from new for quite some time, so that might explain it. But I would love @Saragani or someone else on the team to explain things. I have not put Version Swapper into place yet on this new build, either. Just 9.8.65 at present. 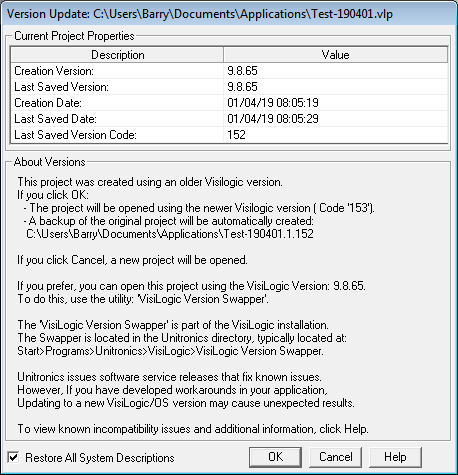 My guess is that there's a mistake in the VisiLogic software that embeds the version code in the project file when first saved. They probably forgot to update that line of code. However, there's different code that UPDATES the project file to the new version when an older version is opened. That code is correct, so once the file gets opened the second time and saved it finally has the correct version code embedded in the file.